Digital transport management by DAKO: TachoWeb provides cross-linked functionalities ranging from transport planning, management of tachograph data and telematics to make your fleet processes more transparent. With TachoWeb, you can manage your entire fleet in one portal – web-based, flexible and secure. Get a personal consultation from our Team or register directly here. (Please note: By sending the registration form, you agree to a binding contract with DAKO. The contract documents will be sent to you by postal service.). 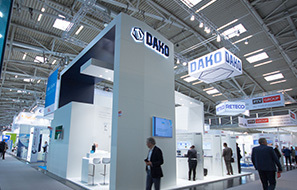 DAKO shows at the trade fair appearance from 4th to 7th June in Munich how well-connected and adaptable systems enable a consistent transportation management. By providing extensive interfaces and modular services, TachoWeb achieves a transparent data flow which is also continued in the mobile extensions, our apps for drivers and dispatchers. With intelligent features like the fully automated tour planning (Smart planner), TachoWeb makes transport processes more efficient and economic. Visit us at hall A3, booth 201/302 and also find out more about our new solutions for media logistics and e-commerce! You can purchase guest tickets directly at DAKO via +49 3641 22778 500. This year from 22nd to 23rd May, the 6th SMART CITY LOGISTIK congress takes place in Schloss Heidecksburg in Rudolstadt. The congress is a networking panel for users, vehicle manufacturers and pioneers of sustainable logistics as well as an information platform about the economic use of alternative drives in transport. Guests of the event have the chance to test new electric vehicles on-site and to get in touch directly with the developers. 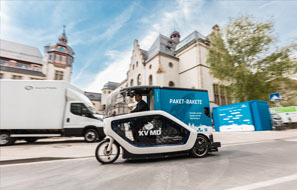 Latest research results are presented by the project SMART DISTRIBUTION LOGISTIK, which focuses on the economic management of the entire supply chain with electric vehicles and develops digital support for this cause. Other main topics are the use of partly autonomous vehicles and the economic transformation towards a sustainable fleet structure. You can register online for the event under http://anmeldung.scl-kongress.de/.